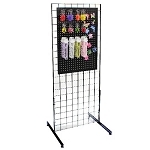 Organizing and setting up your store front is now easier than ever with a Black 4 Way Grid Spinner. Each grid spinner features four directions of organizing space that is available for you and your customers. Constructed of powder coated steel, this black colored freestanding display rack takes up only 18 inches of floor space. Throw in the rotating base and you have yourself a perfect combination also includes a sign holder and adjustable levelers. Displaying accessories, make up, novelty items and even toys could not be made easier. Ordering is a breeze, just click to add this spinning retail rack to your shopping cart today and save yourself time and money. Add the optional grid hooks so you are ready to sell when you receive your order. Get your floor display today at Candy Concepts Inc. and let the shopping begin.